The major project in the nursery this week doesn’t sound like a big deal...we installed three shelves on the wall above the dresser/changing table. Crucial background info: We live in a 100-year-old building. With horsehair plaster walls. I’m sure any of you who have lived in old houses just groaned in sympathetic understanding, while those who have only hung things on sheetrock are thinking, “what’s the fuss?” Well, first of all, it’s very difficult to find studs because there is lathing (strips of wood for the plaster to stick to) behind the plaster and between the studs. So you start with a magnetic stud finder to try to locate the nails that attached the lathing to the studs. In the case of the wall in the nursery, the studs are...not evenly spaced, and there are patches in the wall that throw things off. And once you start drilling, some holes have a tendency to suddenly expand outward at a terrifyingly rapid clip. Once we started putting in the anchors for the screws we had mixed luck. Some went in perfectly, while in other spots we could not drill deep enough into the wall to use them. It was only once a hole disintegrated and enlarged enough to peer in with a flashlight that I realized there are BRICKS in parts of that interior wall. Bricks. We do not have a masonry bit. Also, I don’t think your average anchor really works in brick; we’d need a different kind. And possibly a professional to repair the damage we’d do. After a total of about seven painful, painful hours, spread over two nights, there are shelves on the wall (and we’re still married!). They were more flush and looked better when the brackets were each only attached with one screw, but we decided we’d better finish installing them (which is when holes started enlarging to reveal brick, etc.). We will be limiting the weight on those shelves to very, very light display objects—they actually seem stable enough, but I certainly wouldn’t trust two of the three with anything weightier than a couple stuffed animals. 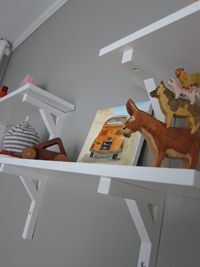 The bottom shelf, luckily, is extremely solid and could potentially be useful. They do look cute, though. As long as you don’t look to closely from the side. By the way, the mattress from Costco arrived and it seems great! It’s a bit softer than I expected; I’d gotten an impression of baby mattresses being floor-like in their rigidity. But I think it’s going to work out just fine. Once the rug comes off backorder at my local West Elm, we’ll be in decent shape with the nursery. Then it’s on to actual gear! 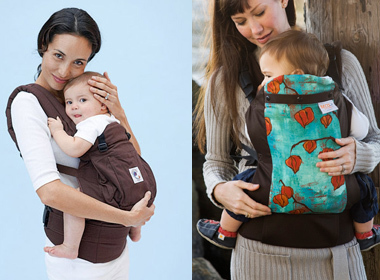 We’re already set on a car seat and stroller, but the carrier debate is a confusing one (Ergo? Beco Butterfly II? ), and I’m baffled by breast pumps. And regarding my heartburn/reflux woe of last week, I finally gave up on Tums and turned to Prilosec OTC, per my midwife’s suggestion. I bought the generic version ($9.99!) and it is miraculous--after all those weeks of misery, I’ve been 100% normal since I started taking it (knock wood). Thank goodness, because I can really feel a difference in my size and degree of lumbering these days. I read that the baby gains up to half a pound per week from here on out, and I believe it!